In these economically depressing times it's always inspiring to discover that some business are not just keeping their heads above water, but positively thriving. Angie Gilmour, from Wishaw, started her house cleaning business from scratch five years ago and now has 20 employees and a growing client list of more than 100 customers throughout Lanarkshire. Angela's Domestic Cleaning Services is one of the fastest-growing firms in the area, with a solid reputation and scores of satisfied customers. But Angie herself admits that the whole thing started almost by chance. She said: “I used to be a financial adviser but when my kids were born I found it really difficult to fit in a full-time job around them. “Nathan's now 11 and Ross is nearly nine but when they were small, because of the expense of nursery fees, I decided to start doing some cleaning in my local area, which is Wishaw. “I used to drop the kids off at nursery and then clean a house for a couple of hours before picking them up later. “I also used to do ironing for people, in my living room. But then the cleaning side of things really started to take off, so I had to give the ironing up. “Through word of mouth, I realised there was a gap in the market for a house-cleaning service, so I decided to turn it into a business. “With that in mind, I had some flyers with a company logo designed, and I distributed them around Wishaw. “From that, I was able to get more customers. By this time the kids were a bit older and were going to school, so I had more free time. “Eventually I got so busy that I decided to take on my first member of staff. That was in 2005. “Since then, the business has been steadily growing and we now clean more than 100 houses all over Lanarkshire. “We have customers in Wishaw, Carluke, Lanark, Hamilton, Motherwell, Bellshill, Airdrie, Coatbridge and Uddingston. “We employ 20 staff, who all work in their own local areas and we also do one-off cleans and spring cleans. Angie gave up the cleaning a while ago and all her working time is taken up by running the company on a day-to-day basis. She added: “I've now moved into an office and all my time is taken up with the administrative aspects of the business. “Over the past two years the number of employees in the company has doubled. “The reason we've got so busy is that, because of the economic recession, people are having to work longer hours and don't have as much time to spend with their families and do the housework. She vets potential new staff very thoroughly, given her company's hard-earned reputation could be irreparably damaged by a rogue employee. 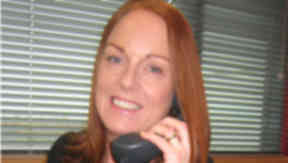 Angie said: “When I'm taking on a new employee I'm looking for someone who is reliable, trustworthy and hard-working. “I need to do a lot of ID checks and I have to know where they live, so that if anything goes wrong I'll be able to sort it out. The staff are all fully insured. Angie is thriving as a business owner but she realises she's at the stage where she'll have to take things to the next level. She said: “Next year I'm hoping to increase the amount of staff and customers and branch out further, into Glasgow. “It would be a good time to think about franchising but I'm not quite ready yet, as I've been too busy running things to find the time to plan ahead too much.